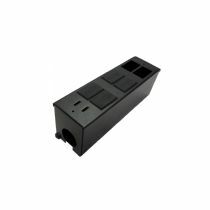 The Excel Grid Outlet Position Box (GOP Box) is available in four versions. The 4 and 6 way are each available with a 25 or 32mm flexible conduit fixing point. The range has been developed for fixing to the end of flexible conduit typically where outlets are presented in a grid layout with cable containment mounted within a raised floor system. The GOP Box then has a degree of flexibility to be positioned within the radius of the flexible conduit to suit the office layout. 25 mm and 32 mm 'L' Brackets are available to fix the other end of the flexible conduit to the floor slab. GOP Boxes are typically then attached to the underside of the desk, the flexible conduit passing through the floor tile via a grommet. The flexible conduit fixing hole is slotted to aid cable installation. As the flexible conduit hole is part of the jack mounting metal work it ensures easy termination of the outlet while maintaining the cable management. The base has two fixing holes for mounting where required. The two parts of the box are assembled with a single machine screw. The area around the fixing hole has been left unpainted to allow an earth bonding lead to be attached if required. GOP Boxes and 'L' Brackets are sold in packs of 10 to reduce packaging waste. The flexible conduit is sold separately.